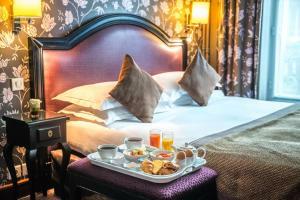 Located in the historic 6th district in Paris, this charming hotel is a 3-minute walk to Saint-Placide Metro Station. It has a 24-hour reception with a tour desk and ticket service. It is 500 metres from both Saint-Germain-des-Près and Montparnasse. Each air-conditioned guest room have free Wi-Fi access, a safety deposit box and a flat-screen TV with international channels. Some of the rooms also have a minibar. The marble bathrooms include a hairdryer and amenities. A buffet breakfast is served every morning in the communal lounge at Royal Saint Germain. After breakfast, guests can use the internet terminal and read the free newspapers in the lounge. Luxembourg Garden is a 10-minute walk from Royal Saint Germain hotel. Montparnasse Train Station is 1.2 km away. Please inform Royal Saint Germain in advance of your expected arrival time. You can use the Special Requests box when booking, or contact the property directly with the contact details provided in your confirmation. Guests are required to show a photo identification and credit card upon check-in. Please note that all Special Requests are subject to availability and additional charges may apply. This room features a flat-screen TV, air conditioning and free internet access. It is decorated in a French style. Rate: € 99.00 ... € 243.00; select dates below to get current rates. These air-conditioned rooms feature free Wi-Fi access and a flat-screen TV with international channels. They also have an en suite bathroom and facilities to make tea and coffee. This family room features a electric kettle, soundproofing and flat-screen TV.